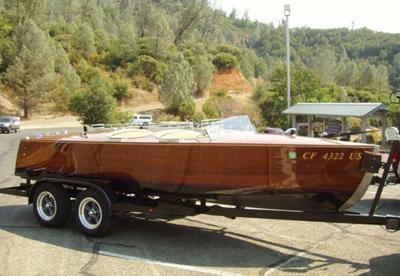 We bought this 1938 Chris Craft 18’ Runabout in 1983. She had been sitting out in the AZ sun and the wood was rotted and broken. We put her in storage until May 2010 when we got her out measured and took lines off, drew and lofted her and started reconstruction. All the wood is new; the framing is White Oak, the diagonal planking is Mahogany. 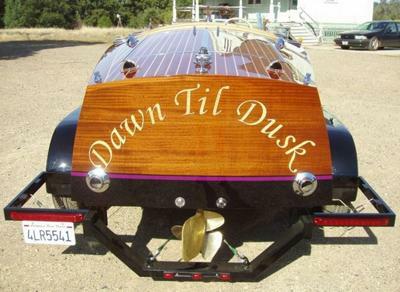 The exterior planking is Sapele with Curly Maple inlayed where the caulking line were and her name, “Dawn til Dusk”, is also inlayed with Curly Maple. She is not a restoration; it’s not reconstructed as originally built. Everything was cold molded and vacuum bagged with epoxy. There are very few fasteners; the vents, cut water, windshield posts, etc are fastened with SS machine screws threaded into SS couplers that are glued in with epoxy. This keeps the water from entering the wood through the strew threads. We went to great lengths to cover every inch of wood with epoxy before applying the finish. The exterior finish is Sherwin Williams Proline, a two part high gloss polyurethane that is made to use below the waterline. 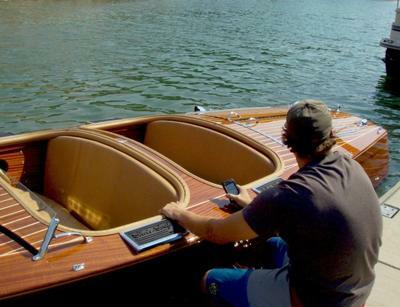 She is powered by a 4.3 liter V6 Chevy, a marine Powerglide transmission, and a Casale V-drive. We remade the engine turned dash bezel copying the original design so that it could hold five gauges instead of the original four. 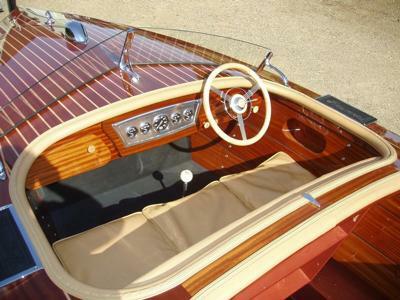 We used “Old Time” Autometer gauges. The original banjo steering wheel is rebuilt with Curly Maple. We did all the work ourselves, even the upholstery, and our son fabricated the new trailer that she sits on. She runs good and we are having lots of fun. You and your very talented family must have put in a lot of hours. You all now deserve to have lots of fun on her.